Twitter has been voted the most popular word of the year by the The Global Language Monitor, with the micro-blogging site knocking 'Obama' off of the top spot. The top 15 words which have been released paint a pretty good picture of how 2009 shaped the world. There's financial words which are darn right depressing – like 'stimulus' (number 4), 'deficit' (number 7) and 'foreclosure' (number 14) – and words that are part of the zeitgeist, including 'vampire' (number 5), 'hadron' (number 8) and, unfortunately, 'unemployed' (number 13). As well as words, phrases have also been counted up and number one on this list, unsurprisingly, is 'King of Pop'. Technology-wise, there's just one phrase which infiltrates the top 10, and that is 'cloud computing'. "In a year dominated by world-shaking political events, a pandemic, the after effects of a financial tsunami and the death of a revered pop icon, the word Twitter stands above all the other words. 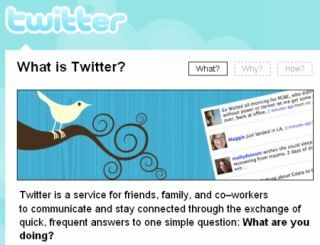 "Twitter represents a new form of social interaction, where all communication is reduced to 140 characters," said Paul JJ Payack, President of The Global Language Monitor. Quite why 'Jedward' didn't make the list is beyond us.